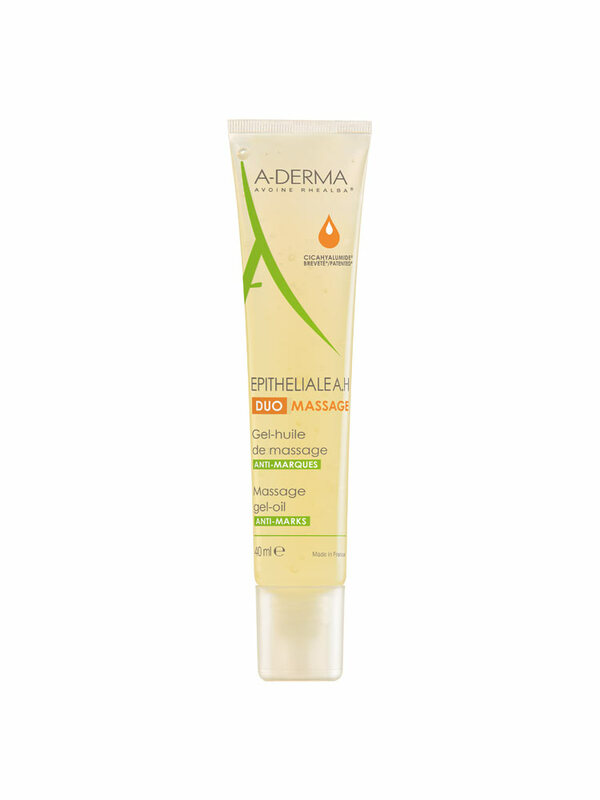 Aderma Epitheliale A.H Duo Massage Massage Gel-Oil 40ml is a gel-oil recommended for the massage of scars and stretch marks and skin made fragile after re-epidermization at risk of scarring. - The gel prepares the skin for a microcirculation stimulating massage. - The oil is ideal for a palpate-and-roll massage that will soften the skin and have an effect on Collagen and Elastin fibers for optimum skin remodeling. It leaves a moisturizing, non-greasy, non-sticky protective film that restores comfort in fragile skin and reduces the urge to scratch. This gel-oil lastingly soothes sensations of tightness and helps to remodel the epidermis thanks to the massage. The stretch marks and scars are less visible. Apply 1 to 2 times per day on the area in question. First massage the skin for few minutes for a few minutes with circular movements, then massage using the palpate-and-roll technique. Can be used as a follow-up to Epitheliale A.H Duo cream. Indication: Attenuate the scars and stretch marks. Caprylic/Capric Triglyceride, Glycerin, Water (Aqua), Olea Europaea (Olive) Fruit Oil (Olea Europaea Fruit Oil), Sucrose Laurate, Tocopheryl Acetate, Alanyl Glutamine, Aevna Sativa (Oea) Leaf/Stem Extract (Avena Sativa Leaf/Stem Extract), Sodium Hyaluronate. Formule contenant 98% d'ingrédients d'origine naturelle.